I'm not a logistics expert, nor do I actively seek translations in this area. But logistics is often an important part of various projects, and I have a good friend working for a freight forwarding company who has sought my assistance for various projects over the past decade, so the field is not entirely unfamiliar to me. I bought this dictionary when it first appeared to enable me to help my friend polish his CV and cover letters when he was between jobs, and it has proven very valuable since then on projects such as quotations for shipping, manuals for special lifting equipment for military tanks, shipping and handling instructions and more. We also own and use the companion volume (EN>DE), which is useful when editing some of the crazy English my friend and his colleagues in various countries produce. When I have my doubts that an English term used is legitimate, I have a quick look i the EN>DE volume and I'm often surprised. Logistics terminology can be pretty nuts. Even with a great dictionary like this, it's good to know someone in the field who can tell you whether your apparently plausible translation really reflects usual usage. When I looked on Amazon.com, I was quite surprised to see that the dictionary was no longer available through Amazon, though a number of vendors sell it via links there, starting at about $88. However, Amazon.de has plenty of copies listed at 64 euros and links to other vendors selling it new starting at 55 euros. I bought my copy ages ago for 60 euros and a week later found another on eBay that I grabbed for 10 euros and gave to my friend as a birthday present. It's worth the full price. Don't let the unprofessional design of the cover fool you - this is the most comprehensive dictionary and the best currently available on the market for the field of logistics. 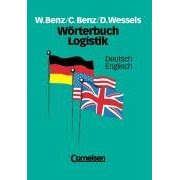 Its sole disadvantage is that, because every term only vaguely related to logistics is listed, the book is relatively thick, heavy and bulky. I disagree with the comment on bulkiness - the volumes are no bigger than most of the good standard dictionaries in my library, and quite a lot smaller and lighter than many. It won't fit in your back pocket, but except for my favorite welding dictionary, I can't think of a worthwhile reference that will. This one is definitely worth buying new or putting on the eBay watch list!